DETROIT — Traffic bottlenecks will cost commuters hundreds of billions of dollars over the next decade if nothing is done to fix them, according to a new study. Los Angeles, New York, Washington, Atlanta and Dallas face the highest costs from such bottlenecks, according to the study released Wednesday by Seattle-based traffic data firm Inrix. The study looked at major cities’ traffic hotspots — defined as areas with repeated traffic jams — and ranked them according to the duration, length and frequency of those traffic jams. The study is the latest attempt to quantify the problem of traffic congestion by Inrix, which collects anonymous data from vehicle navigation systems, GPS systems and smartphones. In a previous study, released in February and based on 2016 data, Inrix calculated that congestion costs U.S. drivers an average of $1,400 per driver each year. That’s mostly the cost of their time and fuel, but also the increased cost they pay for goods. If a vegetable truck sat in traffic and used more fuel, for example, a grocery store might have to charge more for the vegetables. The latest study narrowed its focus to the 100,000 traffic hotspots within the largest 25 cities in the U.S. Inrix measured traffic patterns at those spots in March and April of this year. New York had the most hotspots, at 13,608. But Los Angeles topped New York in the rankings because of the severity and frequency of its traffic jams. At one Los Angeles hotspot — where U.S. 101 South connects to CA-134 and CA-170 — the average length of a traffic jam is 355 minutes, and it stretches for an average of 4 miles. Inrix counted 108 traffic jams at that spot in the two-month period. The worst hotspot in the country was in Washington, where I-95 South connects to the Fairfax County Parkway. The average traffic jam in that area lasted 33 minutes and was 6 miles long; Inrix counted 1,394 traffic jams in the two-month period. The cost is staggering. From now through 2026, hotspots will cost Los Angeles commuters $90.9 billion and New York commuters $63.9 billion. Boston — at No. 10 in the rankings — faces an $18.9 billion price tag for its 4,158 traffic hotspots. Phoenix, at No. 15, faces a $9.5 billion cost for its 3,441 hotspots. The estimates mostly take into account the value of drivers’ time, which is based on median household income and other factors. The U.S. Department of Transportation has set a value of $12.81 per hour for a commuter and $25.19 per hour for a business traveler. Non-business travel, like running errands, is worth $9.51 per hour. Inrix also factored in 57 cents per minute for the cost of fuel and for the health and environmental cost of increased carbon emissions. The study used the federal government’s set costs for the impact of emissions, Pishue said. 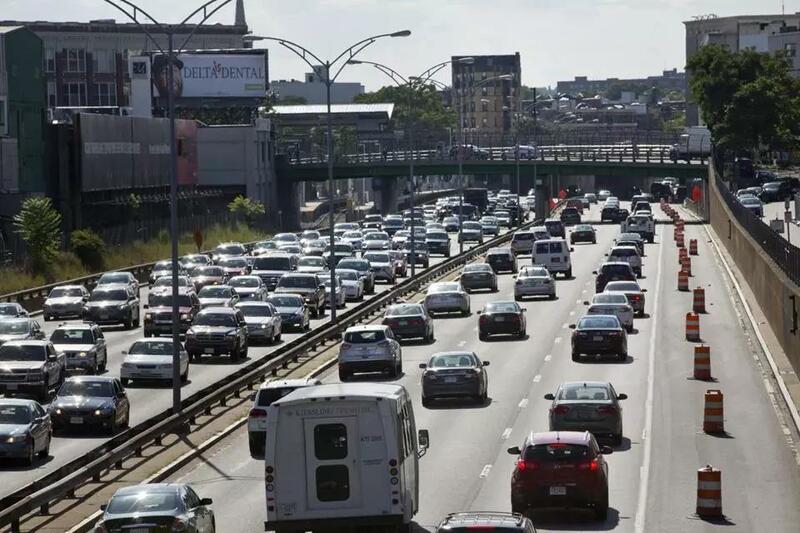 As much as drivers might dream of wide open highways and fast commutes, getting rid of traffic congestion isn’t a realistic goal, Pishue says. ‘‘It is physically possible to eliminate congestion, but do you really want to add 40 lanes to a highway?’’ he said. Instead, cities should think about alternative solutions, like opening roadway shoulders during peak traffic times. Seattle recently spent $11 million to open 1.8 miles of highway shoulder on the I-405 during peak commuting times. Pishue says traffic flow has improved as a result. Chicago also added lanes to one of its peak hotspots to improve traffic. Downtown areas can’t add lanes without knocking down buildings. But they can retime their traffic lights or manage traffic in and out of the city by changing lane use and speed limits at peak times. In San Francisco, some parking meters charge higher rates at times of peak demand. Commuters can also mitigate the costs of commuting, Pishue says. Working from home and carpooling cut down on traffic. In some places, like Seattle and Los Angeles, people have even voted to tax themselves to pay for infrastructure investments. Last fall, voters in Los Angeles County approved Measure M, a sales tax meant to pay for projects that will ease traffic congestion, including expanding public transportation.